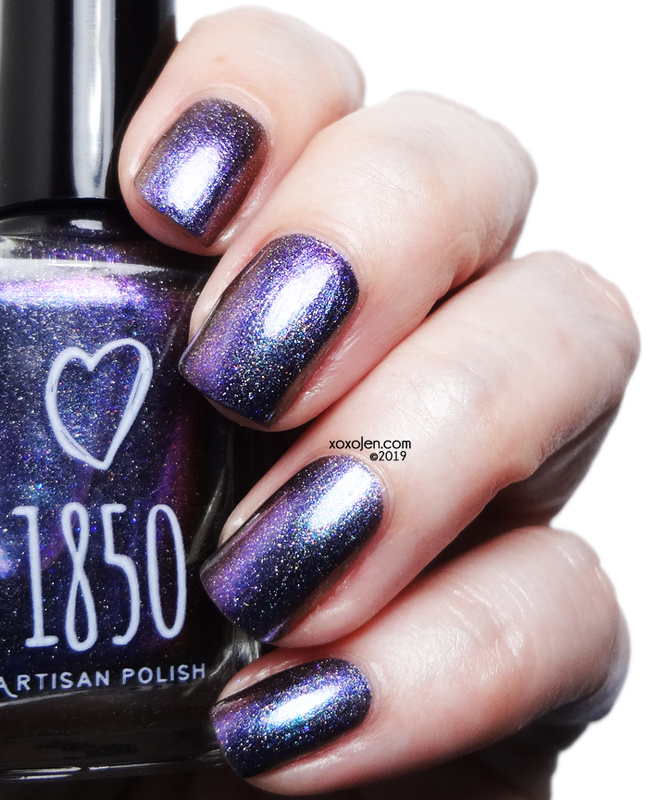 1850 Artisan Polish is one year old and they are celebrating with a beautiful, sparkling trio! I am pleased to have the opportunity to share them with you. There's a good range of finishes here including multichrome, a thermal and a topper! These are available right now! This year has been filled with dreams come true for 1850, and that joy is shared here in color form. 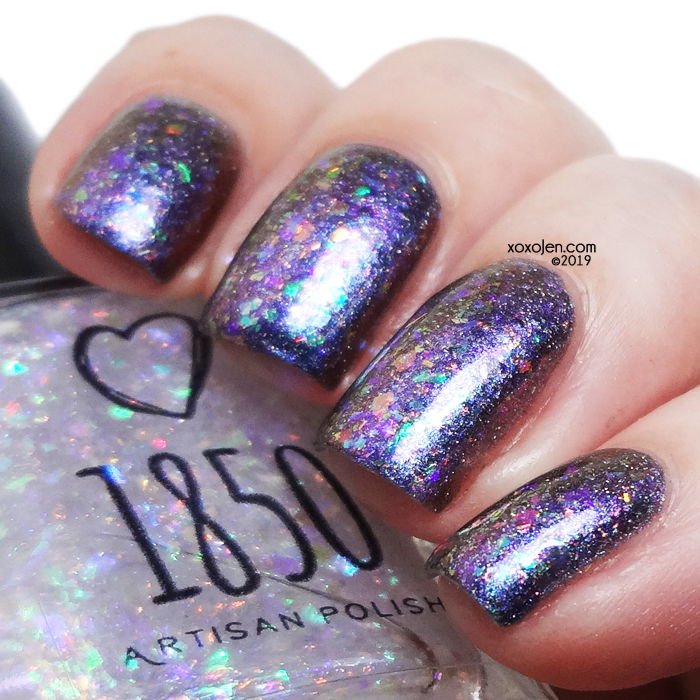 This multichrome will appear primarily purple or blue depending on lighting, but it will always shift through purple, turquoise, blue, green, and gold. The addition of an outrageous array of aurora shimmers adds to the color shifts and sparkles that are topped with scattered holographic microflakes. Shown is two coats with topcoat, formula was good/no issues. 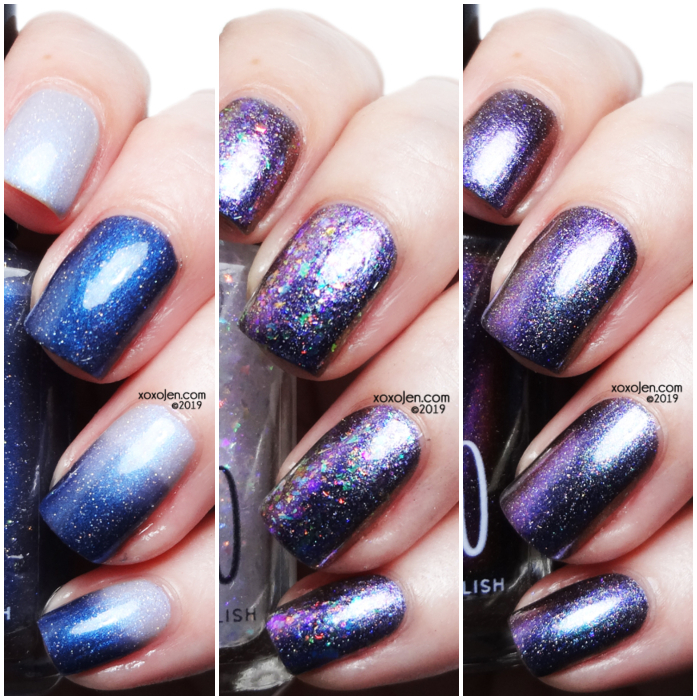 The fun Jellyfish toppers all got together for a party and invited gorgeous blue to purple aurora shimmers to join the celebration. 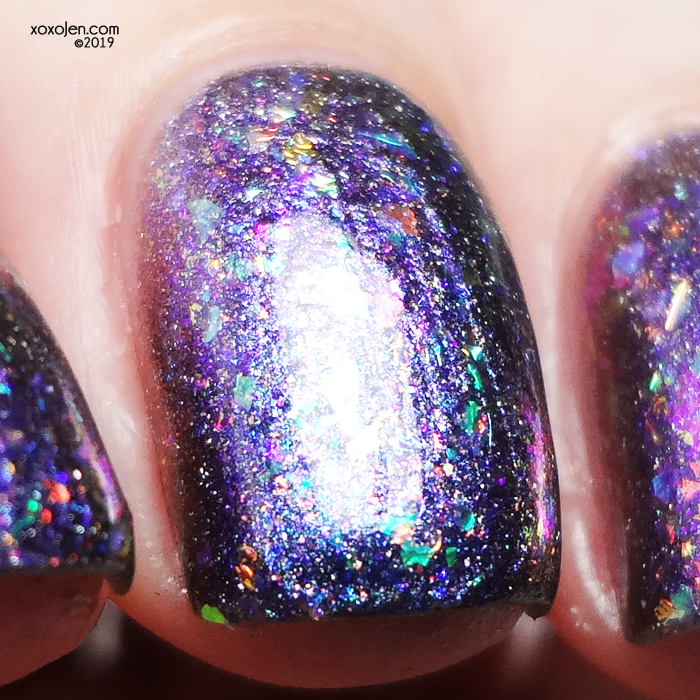 This rainbow of transparent multichrome flakes looks great as a topper over any of your favorite shades. Shown here over A Year Of Dreams, but 1850 recommends trying it over their one coat black cream, Squid Ink. Loads of flakes in two coats, I think one coat would have been plenty but I love flakes and couldn't resist doing two coats. 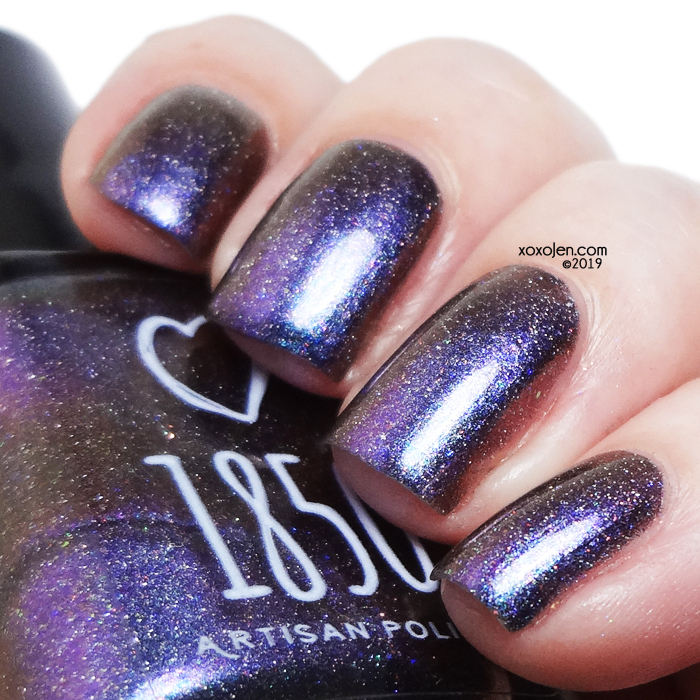 The sister polish to Dichotomy, 1850's #1 best seller of their debut year! Multidimensional darkened royal blue when cold, and icy white with blue shimmer when warm. 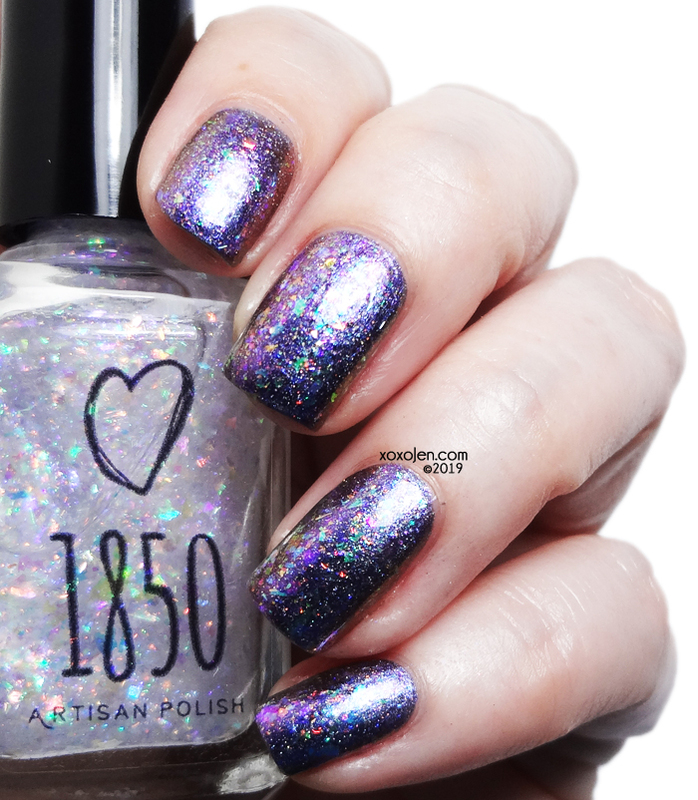 Generously filled with silver holographic glitters that give this beauty a celestial sparkle. 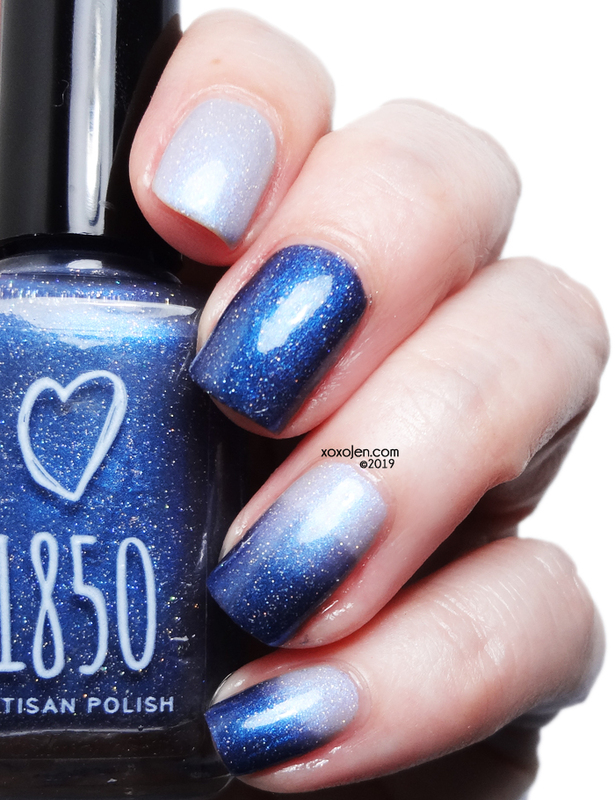 What 1850 didn't tell us was that there's a third color lurking in this formula when the polish is in transition, a medium-ish shade of blue! It was super easy to capture the changes for this polish, which for me is unusual. (I have hot hands, always!) I used two coats and the formula was good/no issues.